Looking for a premium wool carpet that's produced here in the UK, then look no further than Brockway Carpets. An array of colours, styles and textures make Brockway one of the leading carpet manufacturers who since 1964 have been a family owned business in Kidderminster, Worcestershire. 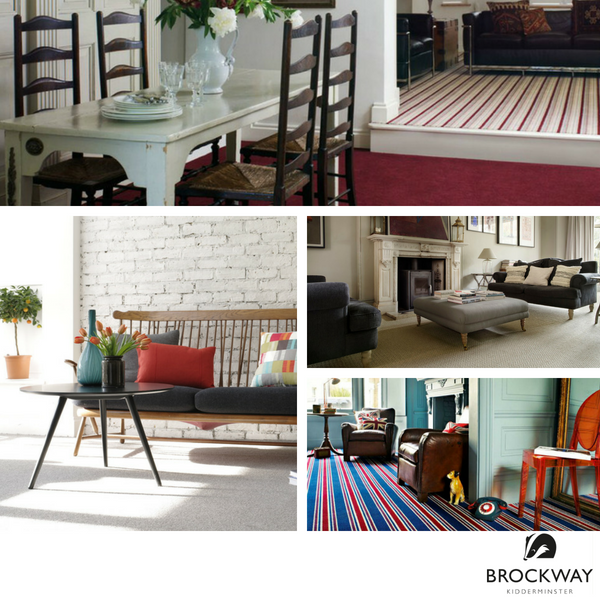 Contemperary and Stylish, Striped Carpet is ever popular in the modern home and with a wealth of designs to choose from, Brockway has everything covered. The striped ranges available are luxurious carpets such as Dimensions Heathers, Lakeland Herdwick, Portofino and Solar Stripe which are all hard wearing and incredibly fashionable. Plush and Durable, Brockways collection of Plain Carpets are in a league of their own. The luxury of all the ranges which are manufactured with two and three fold yarns means these carpets will stay beautiful for years to come. At Bramley Carpets we offer the complete portfolio consisting of best sellers such as Connections, Dimensions Plain, Lingdale and Rare Breeds. Full of natural charm the selection of Textured Carpets from Brockway are second to none. These trendy loop pile carpets are produced with uncut wool loops that have a structure designed to bounce back into shape making them perfect for busy areas like hallways and stairs. At the Heaton Moor showroom we have the complete selection of Brockway loop pile carpets from the popular Beachcomber range to the Cavendish Collection all available at fantastic prices.